The Future of Social Ventures Conference that took place on Friday, March 16 at UC Berkeley featured several Miller Center Global Social Benefit Institute (GSBI®) connections, including keynote speaker Carlos Orellana, CEO of the 2012 GSBI® alumni enterprise salaUno, and current 2018 GSBI social enterprise Untapped. 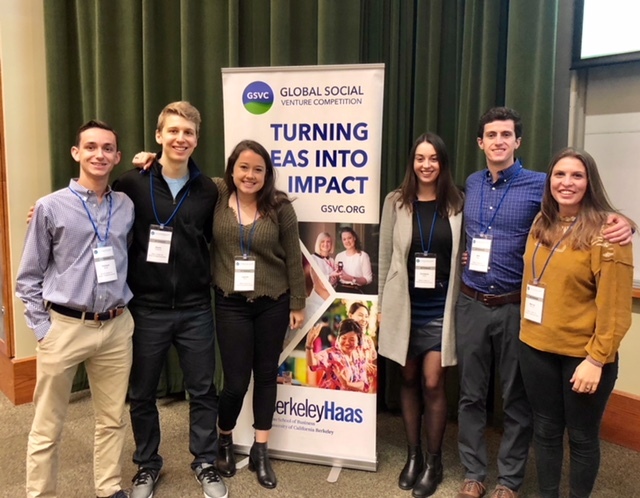 The Global Social Venture Competition (GSVC) is a pitch competition providing exposure and mentorship to aspiring social entrepreneurs, a model that complements Miller Center’s accelerator programs. GSVC focuses on finding innovative solutions in the social enterprise space, while Miller Center’s Global Social Benefit Institute (GSBI) offers stage-specific support to social enterprises to help them scale. Several Miller Center student employees attended, including Gavin Cosgrave and Richie Garner, and 2017 Global Social Benefit Fellows Will Paton, Christina Harris, Marisa Rudolph, and Lauren Oliver. The students networked with conference attendees, learned from successful entrepreneur speakers, and watched presentations from several of the competing teams. Orellana kicked off the conference with his keynote speech about his path from a career in finance to pursuing degrees in business and public health at UC Berkeley. There, he learned about Aravind, and realized that a similar business could benefit Mexicans suffering from blindness. Orellana discussed the challenges he faced with adapting Aravind’s business model to Mexico, and how salaUno and Aravind have since worked together to achieve mutual success. Today, SalaUno is the leading provider of cataract surgery in Mexico City. Next up, Miller Center student employees attended a workshop hosted by OpenIDEO titled “Circular Design for Social Impact.” OpenIDEO is an online community platform that hosts challenges around a variety of global issues, an excellent pipeline partner for GSBI programs. Wawira Njiru, founder of the 2017 GSBI Accelerator alumni enterprise Food 4 Education, started her business through an OpenIDEO challenge for creating ideas to help urban slums combat climate change. At the workshop, OpenIDEO staff presented on the potential for rethinking products and services to account for their whole life cycle, from manufacturing to disposal. Teams of conference attendees were given two options for imagining new solutions: repurposing material waste from Nike shoes to create new products, or creating a new venture around reducing food waste. Each team progressed through the design thinking process and presented elevator pitches for their ideas at the end of the short workshop. Following the workshop, Samasource and LXMI CEO Leila Janah spoke about her journey founding the companies, and about the potential of social enterprises to reduce poverty. Samasource has employed almost 10,000 bottom-of-the-pyramid workers to complete data entry and machine learning algorithm work. Janah recently wrote a book, “Give Work” about the power of jobs to lift people out of poverty. During the afternoon pitch competition, the seven Global Social Venture Competition finalists from the U.S. West Coast region pitched their ideas and fielded investor questions. Second among the batch was current GSBI In-Residence enterprise Untapped, which provides a clean water and last-mile distribution platform for developing markets. Untapped creates water-treatment centers that double as local distribution hubs to reach remote villages. Although Untapped did not advance to the world finals in Milan, they will continue to hone their enterprise for the 2018 GSBI In-Residence in August.